Seyi Popoola-Adkins joined LM Information Delivery in September 2018 as Customer Service Manager for the UK and Ireland. She may be fairly new to the world of publishing and subscription management but has worked in customer services for approximately 22 years, having previously worked various sectors such as telecommunications and housing. Although the industries may differ, good customer service is a universal requirement in all sectors, according to Seyi. As Customer Service Manager, Seyi’s responsibilities include managing the UK Customer Service department, including training the team and ensuring they’re confident and supported in their daily work. She’s also the first point of contact for the escalation of any customer service issues. Seyi is particularly excited about the recent development work undertaken by LM Information Delivery to improve the Customer Service experience with the introduction of Salesforce’s ServiceCloud. We are currently working on connecting different key articles and topics to our ServiceCloud which will also enable us to monitor our service metrics and track key performance indicators in a revolutionary way, unprecedented within the industry. “The best part of it all is that our Customer Service can directly link information to our Sales staff, so that they are also updated with vital information” she added. Seyi is married with 3 children (2 daughters and a son). In her spare time loves listening to music, reading and is a committed supporter to her children’s many hobbies which include Karate, Dance, Netball and Football. 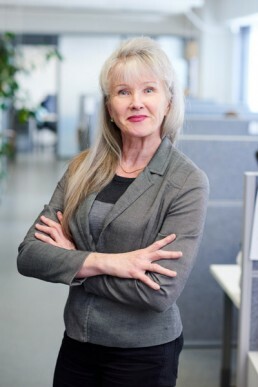 Marja-Liisa Himanen, a Business and Training Manager at LM Information Delivery has worked for the company for nearly 30 years. She is currently working at the Headquarters of LM Information Delivery in Helsinki, Finland. She started to work with the company back in 1991. During these 30 years the company has changed a lot. Marja-Liisa is proud to have been able to witness and contribute to the growth and international expansion of LM Information Delivery. During her years with the company, it has grown from the Finnish market leader, to the leading subscription agency in Scandinavia and now to one of the leading subscription agencies globally. She is at her best when there is challenging situation that needs solving. The most rewarding task in her opinion is to solve challenging situations. Daily challenges keep her going. According to Marja-Liisa there are many exciting developments happening in the industry at the moment. LM Information Delivery is continuously developing solutions and services to serve its customers even better and match the changes in the industry. Technological and other changes affect Marja-Liisa’ s work as well. She is continuously trying to keep herself on top of the changes and work alongside of our customers to help them adapt to the continuously changing landscape. In her free-time Marja-Liisa enjoys relaxing with a good book and a glass of red wine – however, this is certainly well deserved, as she lives an active lifestyle and regularly cycles over 20km a day to and from the office. As she says in her own words; “To be able to enjoy the book and wine, first some kind of physical exercise is required”.